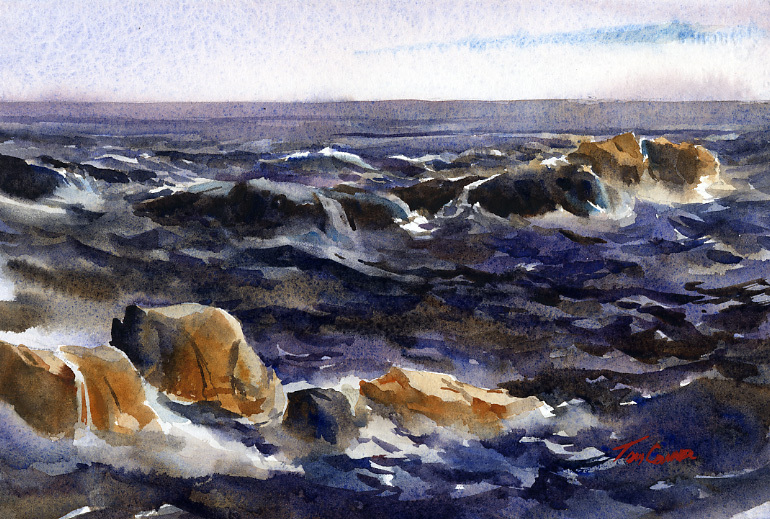 “Back Shore Surf ” – 7″ x 11″, matted to 11″ x 14″ for easy, low-cost framing. This is another painting done during Cape Ann Plein Air 2017 and one of two paintings done of sky, surf and rocks. Surf and rocks is a subject of unending fascination for me. 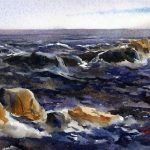 The contrast of static solids – rocks – among constantly moving and changing surf is mesmerizing and, obviously, challenging to paint. This particular scene was done on a mostly cloudy afternoon. The water was mostly calm and dark. Catching the movement of the water and surf while working with a relatively dark range of value was the most challenging.